Michael Bigham is a writer and ex-cop. As a volunteer, he’s taught creative writing to street people at Dignity Village, a local homeless camp and to recovering drug addicts in residential treatment. Michael holds an MFA in Fiction from Vermont College and lives in Portland, Oregon with his wife and daughter. He’s currently hard at work on a mystery novel set in the Central Oregon high desert. Teresa Tumminello Brader, Kenner, LA. Teresa Tumminello Brader was born in New Orleans and lives in the area still, not far from a levee that is currently being elevated. She holds a B.A. in English from Marquette University and is the mother of two grown children. Her short fiction can be found online at several literary sites, including Hobart, Clapboard House and Apollo’s Lyre, in print in Six Sentences Volume 1, Families: The Frontline of Pluralism and hoi polloi III, and forthcoming in From the Porch Swing. Her non-fiction has appeared in print in the Village D-Lights, a collectors’ magazine, and online at Debris Magazine. Ajani Sebastian Burrell, Brooklyn, NY. Ajani Sebastian Burrell was born in Detroit, Michigan, and raised thereabouts. After graduating from the University of Michigan, he moved to New York, and later Munich, before heading to the tranquil environs of Michigan’s Upper Peninsula, where he received an MFA from Northern Michigan University in 2009. With a writing partner, he recently completed a feature-length screenplay entitled The Blessing, and is currently hammering away on an as-yet-unnamed novel. His work has appeared in Barrelhouse and The Saint Ann’s Review, among others. When not writing, he’s usually working or watching football (no, not that football; real football, the kind you play with your feet). He is neither married nor with children. He lives in Brooklyn. Susanne Dutton grew up just south of San Francisco, has transplanted herself many times and lives currently in a tiny 1920’s apartment in the gorgeously treed Dilworth neighborhood of Charlotte, North Carolina. She has been married for thirty-one years to a brave man named Tom and together they have two gutsy, grownup children toughing it out in the arts in big northeastern cities. Susanne has been a teacher, a minister, a counselor and most lately, a mediator in the courts. These days, she aims herself at her keyboard every morning, hoping to be diligent, dogged and lucky enough to write something worth reading. Lou Fisher lives with his wife in downstate New York, to where his older daughter has come home a couple times, after college and after an early divorce. 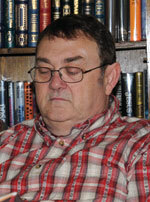 He teaches for the Long Ridge Writers Group and his stories have appeared in numerous magazines and journals . . . and have been selected for several anthologies including the recent Bar Stories (Bottom Dog Press 2008), The Way We Work (Vanderbilt University Press 2008), and Hunger and Thirst (City Works Press 2009). He is a recipient of the New Letters Literary Award for Fiction as well as a writing fellowship from his county’s arts council. His earlier genre novels were published by Dell and Warner. Ida Bettis Fogle, Columbia, MO. Ida Bettis Fogle lives with two kids, various pets and one husband. She’s been writing off and on for years, while holding a variety of day jobs including selling survey equipment, office managing, test proctoring and, currently, book waitressing at the local public library. She once got her name into the Guinness Book of World Records for kicking a footbag (Hacky Sack™) a lot of times in five minutes. (1997, page 233.) Her work has appeared in publications here and there, including Well Versed, Thema, and The First Line. She’s not sure what she’d do in her spare time if she had any. “Winter Man” is an excerpt from Diamond Light after Snowfall, a volume of reflections on the aesthetic merits of climbing in order to ski in the wild. His ski fiction has appeared in Off-Piste: The Backcountry Ski Journal, Ascent, and the Black Diamond Catalogue. His experiences in the pursuit of fresh powder snow are the inspiration for his stories. Elise Glassman’s fiction has appeared in The Colorado Review, Neon Beam, and The Summerset Review. She has studied fiction writing at the University of Washington Extension Program with award-winning authors such as Laura Kalpakian, and at the Iowa Summer Workshop with Marilynne Robinson. More of her stories will appear this year in The Portland Review and The Main Street Rag. Karen Guzman has published short fiction in a variety of literary magazines, including Melusine, Words & Images, Many Mountains Moving and Eureka Literary Magazine. Also a journalist, her work has appeared in the Hartford Courant, Raleigh News & Observer and The Washington Post. She has a degree in journalism from Boston University and an MFA in fiction from George Mason University. Currently working on a novel, she hopes to return to short fiction. Karen lives in Connecticut with her husband and son, and two distinguished, senior citizen cats. This story, “Spin,” is dedicated to Kurt. A graduate of the University of Iowa Writers’ Workshop, his poems have appeared in Green River Review, Kentucky Poetry Review, South Florida Poetry Review, English Journal, Epitaph, Slant, Black Bear Review, Pebble Lake Review, The Main Street Rag, The Shop (Ireland) and many other publications. He has published one chapbook: and cuffed to the Jukebox. In addition to poetry, he has edited an anthology of short stories: New Visions: Fiction by Florida Writers, authored a collection of essays, Tropical Son: Essays on the Nature of Florida, and has published five novels, The Death of Cousin Rose, The Second Sorrowful Mystery, A Great Day for Dying, Saint Valentine’s Diamond, and Death on the Southwest Chief. JoeAnn Hart is the author of Addled, a social satire, published in May 2007 by Little, Brown, and her essays and short fiction have appeared in numerous journals and magazines. Recent stories have been published in Kalidoscope, Hobart, Inkwell, and The Georgetown Review. She is a regular contributor to The Boston Globe Magazine. Dawn Marar’s writing has appeared in Painted Bride Quarterly and Art Times: A Literary Journal and Resource for All the Arts, among other publications. She has worked as a free-lance writer. New work will appear in an upcoming Kearney Street Books’ anthology, Tribute to Orpheus 2. She has degrees from Skidmore College and Columbia University, and has lived in London, Manhattan and Jordan. Nancy McKinley writes fiction, creative nonfiction, and cultural history. Her story “Night Glow” appears in the MSR Short Fiction Anthology: Big Water and “Goat Meat” will appear in MSR Short Fiction Anthology: Commute. Her novel, Travels with a Nuclear Whore, won the Thayer Creative Writing Award and seeks publication. Nancy earned her PhD from SUNY-Binghamton, MA from Colorado State University, and BA from College of the Holy Cross where she was one of the first females at the previously male school. Nancy teaches with the graduate, low residency creative writing program at Wilkes University. Tom Quinn is from Bucks County Pennsylvania. By day he provides physical therapy to the special needs population. Nights and weekends, he barnstorms the eastern seaboard as coach of his 14 year old AAU basketball team. A lover of Chekhov, Carver and Bukowski, his poems and short stories have appeared in various journals and magazines including Spitball, The Haz Mat Review andThe Main Street Rag. And if you have managed to read this far, he poses you the question: Which has more freedom-a kite that is stuck in a tree … or one that is not? Nicole Louise Reid is the author of the novel In the Breeze of Passing Things (MacAdam/Cage) and fiction chapbook Girls (RockSaw Press). Her stories have appeared in Sweet, The Southern Review, Quarterly West, Meridian, Black Warrior Review, Confrontation, turnrow, Crab Orchard Review, and Grain Magazine. She is recipient of the Willamette Award in Fiction, and has placed in Santa Fe Writers Project Literary Awards, Press 53 Open Awards, Pirate’s Alley William Faulkner Short Story Competition, the F. Scott Fitzgerald Literary Society, and Glimmer Train. She teaches creative writing at the University of Southern Indiana, where she is fiction editor of Southern Indiana Review and editor of RopeWalk Press, and directs the RopeWalk Visiting Writers Reading Series. Louise Farmer Smith, Washington, DC. Louise Farmer Smith grew up in Oklahoma. She has taught English, trained as a family therapist, and managed a U.S. Congressman’s office. Her stories have appeared in magazines including Virginia Quarterly Review and Bellevue Literary Review which published her “Return to Lincoln,” a 2005 Pushcart nominee. Her story, “Apartment on Riverside Drive” took first place in a Glimmer Train’s 2006 story contest. She lives in Washington, DC, where she is completing a story collection, Cadillac, Oklahoma. This is C.G. Thompson’s first appearance in an anthology. Her short stories have appeared in The Main Street Rag, The Bittersweet Oleander, The News and Observer’s Sunday Reader, and Wisconsin Review, among others. In 2009, her short-story chapbook, Don’t Look Down, was a finalist in the Spire Press Prose Chapbook Contest, and in 2008 she won the NC State University Poetry Contest. She was a reporter for several years and has also taught English composition. “Where Three Corners Meet” is fortunately not autobiographical, although a rival high school where she grew up did indeed sadly give way to a grocery store. “Home is where the heart is.” It’s a saying as old and unquestioned as time itself. But anyone who has had to leave home knows that coming back is never the same. Beyond physical setting, home is also an ideal. Common cultural metaphors abound: home as individual salvation, home as protector, home as destination for personal achievement. Home is the backbone of so many life experiences that there are always layers that can be peeled back to reveal deeper truths. It wasn’t difficult to find numerous perspectives on these truths. Manuscripts from across the globe were considered. The more difficult task, of course, was selecting those stories that embodied the theme in the fullest. Ultimately, the works that both informed and enchanted in the most well-crafted narrative voices were selected for publication. This anthology is a collection of stories about “coming home” in the broadest sense. The stories suggest that the common denominator of all homecomings, either physical or metaphorical, is much more than a return to place or the attainment of an ideal. Beneath the childhood neighborhoods, beneath the cultural traditions, beneath the bloodlines and folklore lies a curious and beautiful network that captures the human predicament. What matters in the end is how we respond to the changes that come when these inner workings are glimpsed. The characters in these stories come head-to-head with these complexities, maneuvering across new terrain the only way they know how: sometimes humbled, sometimes shocked, always curious and keenly aware. In all cases, the nuances of change are palpable and the renderings of home in all its incarnations truly memorable. 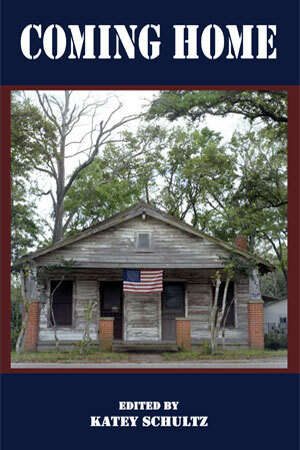 Be the first to review “Coming Home, a 2010 Main Street Rag Short Fiction Anthology” Click here to cancel reply.